Faced with tremendous uncertainty about the future of the U.S. healthcare system, doctors stress levels are at an all-time high. 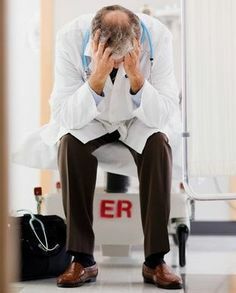 Unfortunately, the combination of chronic stress and depression can lead to exhaustion, cynicism, and ineffectiveness – otherwise known as physician burnout. U.S. News reported that doctors are 15 times more likely to burn out than professionals in any other line of work, and 45 percent of primary care physicians report that they would quit if they could afford to do so. The latest study by theMayo Clinic study shows over 50 percent of U.S. physicians are now suffering at least one symptom of burnout. The effects of physician burnout are far-reaching. Not only is it bad for doctors and their families, but burnout also effects staff and patients, and healthcare organizations overall. Consistently schedule support staff (e.g., MAs, RNs, etc.) with the same providers. Outsource time-consuming tasks, such as coding, to other departments or other staff members in the organization. Pilot a call “cap and trade program” in which providers are compensated more if they are willing to take more call time. This may relieve the burden on providers who find it difficult to take call shifts because of personal obligations. Implement clinic changes, such as regular care team huddles. Work with occupational health or organizational development departments to hold training sessions on building trust and respect within the team. Recognize accomplishments of providers at staff meetings or through one-on-one recognition. Begin meetings by sharing patient case studies. Distribute agendas before meetings and provide minutes shortly after to recap discussions. Ask providers for their input on the minutes. Work with your electronic health record (EHR) vendor or IT department to provide better EHR templates that are consistent, easy to read and clinically meaningful. Provide additional EHR training to providers to improve proficiency and ensure they have skills needed to use the system effectively.